My heart, as well as my memory cards, and credit cards are full after a trip to northern New Mexico in search of southwest Christmas scenes. Reconnecting with dear friends/family, and wandering around Santa Fe, Tesuque, Pajoaque, and Chimayo, New Mexico always leaves my spirits high. 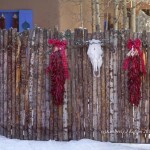 Take a look at my latest New Mexico photographic wanderings in my Southwest album. ← Christmas is almost here!